Apple updates the MacBook Pro with the new design (more about it tomorrow when I get some coffee). The new MacBook Pros feature 2 videos cards (an integrated one and a GPU). It also features a glass trackpad that acts as a button (no physical button! ), just press the track to click. 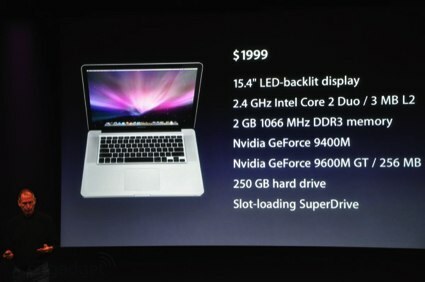 The 17-inch MacBook Pro was only refreshed, as it will keep the old design of the MacBook Pro for now.